You can find menstrual cramp relief, there is no need for you to suffer. A weak thyroid gland or weak adrenal glands. Have your Doctor check your thyroid TSH levels. One of the best solutions is a ginger supplement. Ginger is a natural antispasmodic and anti-inflammatory. Making an herbal tea with ginger can help but usually it won't be enough. 1 or 2 days before you expect your period, you take 2 capsules of ginger in the morning and 2 at night. Continue over the days when you normally have cramps. Some women may need to take 3 capsules twice per day. I have used this myself and helped many of my clients alleviate their suffering this way. 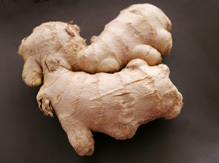 Ginger is also great for headaches; take 2 or 3 capsules when needed. Chamomile (not if you experience heavy bleeding as chamomile is a natural source of estrogen and can increase bleeding). Lobelia extract can be massaged on the abdomen. A complex B vitamin taken all month and B6 taken the last 2 weeks of your cycle will help a great deal with cramps and also other symptoms of PMS, such as irritability and moodiness. A calcium supplement can also be helpful for menstrual cramp relief. Vitamin D, silicium and magnesium help the body to absorb calcium. Products that help cleanse the liver and the colon can be very beneficial. If these are congested the pelvic region can easily become congested as well. If you experience very heavy bleeding as well as severe menstrual cramps book a consultation with me. There are many natural products that can help you slowly reduce the intensity of the bleeding, eliminate clotting, which can be a main cause of pain, and eliminate the severe cramps. I have helped my clients go from taking 3 to 4 heavy pain killers per day, to not needing any painkillers at all. See PMS for more tips on alleviating PMS symptoms. or stroke, which can be fatal. Serious gastrointestinal side effects include bleeding, ulceration, and perforation of the stomach or intestines, which can be fatal. These events can occur at any time during treatment and without warning symptoms. There are many natural options available for menstrual cramp relief. Find the right solution for you and your discomfort will be a thing of the past.